RSPB Titchwell Marsh Nature Reserve01485 210779work Nature ReserveThousands of migrating birds pass through Titchwell in spring and autumn, and many spend winter here, giving you an unrivalled opportunity to see many species of ducks, waders, seabirds and geese. As the days lengthen again, some birds like curlews are already departing north, whilst others such as wheatear and sand martin are arriving from Africa. Titchwell Marsh is, not surprisingly, one of The RSPB's most popular reserves from sandy beaches to lagoons and reedbeds - it's all here! See the magnificent Marsh Harriers soar overhead! Something for everyone. Don't miss our GUIDED WALKS! Visitor centre, cafe and shop open 9.30am. Café closes at 4.30pm and shop/visitor centre at 5.00pm. Both close at 4.00pm from October to mid February. Car Park Free to members, a facilities charge of £5.00 per car to non-members. Public toilets, with disabled facilities, in the reserve car park. Titchwell Marsh nature reserve is an Area of Outstanding Natural Beauty, with its wild open spaces and breathtaking views across the Wash; it is easy to see why. Visitors to Titchwell are able to explore a diversity of wildlife habitats within a one kilometre walk of one of north Norfolk's best stretches of beach. From migrating birds who make their home here over winter to the arrival of swallows and cuckoos in spring, there is always something to see. With other wildlife on show such as tiny kidney spot ladybirds and zebra spiders to the larger Chinese water deer, Titchwell marsh is a nature lover's delight. Families of water vole play in the fresh water pools where dragonfly and damselfly lazily hover and wheelchair friendly viewing platforms enable visitors to have a close up view. A recently added wildlife garden serves as a miniature replica of the reserve and is filled with easy to copy ideas for creating wildlife habitats at home. Be it a hedgehog hotel or insect hideaway, everything in the garden has been made from recycled materials. Natural planting enhances the theme and encourages a variety of invertebrates, birds and mammals to the area. With guided walks and self-led nature trails there is plenty for everyone to enjoy. Monthly activities range from pond dipping to stargazing and with our exclusive 'snore and explore' nights, visitors can stay overnight on the reserve and discover Titchwell's nocturnal inhabitants. Thousands of migrating birds pass through Titchwell in spring and autumn, and many spend winter here, giving you an unrivalled opportunity to see many species of ducks, waders, seabirds and geese. As the days lengthen again, some birds like curlews are already departing north, whilst others such as wheatear and sand martin are arriving from Africa. 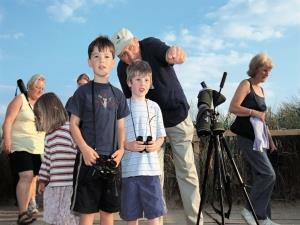 For keen wildlife observers and new explorers there is so much to do. Come for an hour, stay for the day. Full Disabled Access (except access to the beach). Daily dawn-dusk. Visitor Centre open daily 9am-5pm, Café open 9.30am-4.30pm. Closed 24 & 25 Dec.
RSPB members FREE. Facilities charge is now £5 per car for non-members. Take the A149 to Titchwell. From King's Lynn station it is 22 miles to RSPB Titchwell Marsh Nature Reserve.